A total of 2,235 2017 batch ‘B’ (Stream II) corps members deployed to Kaduna, Niger and Kogi States by the National Youth Service Corps (NYSC) are expected to camp in Kaduna for the orientation exercise between Tuesday, 16th January to Monday, 5th February 2018. 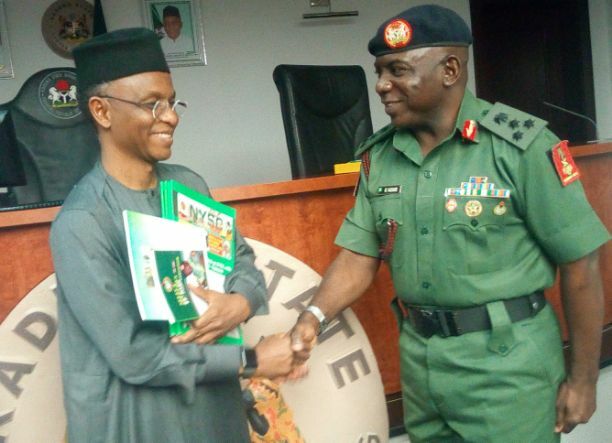 The need for the joint orientation course for the batch was not stated by the scheme but may not be unconnected to fewer number of prospective corp members deployed to these states – Kaduna 1,235, Kogi 500 and Niger 500. Assistant Director, Public Relations Department of the scheme, Sam Nkwopara in a statement said, the state has made adequate preparation to host these young Nigerian graduates at the NYSC permanent orientation camp, kilometers 16, Kaduna-Abuja highway by Sabon Gaya, Chikun local government area of Kaduna state. Kaduna State Governor, Nasir El-Rufai is expected to preside over the swearing ceremony for the course participants on Thursday, 18th January while Chief Judge of the state, Justice Tanimu Zailani will administer the Oath of Allegiance on prospective corps members. He however called on employers who desire the service of corps members deployed to Kaduna State to apply now stating clearly the number of corps members, course/discipline required and the welfare provision put in place for them. Orientation course is the first of four cardinal points of NYSC followed by primary assignment and community development service while passing out parade signifies the end of one year mandatory service to motherland by fresh Nigerian graduates whether schooled within or outside the country.